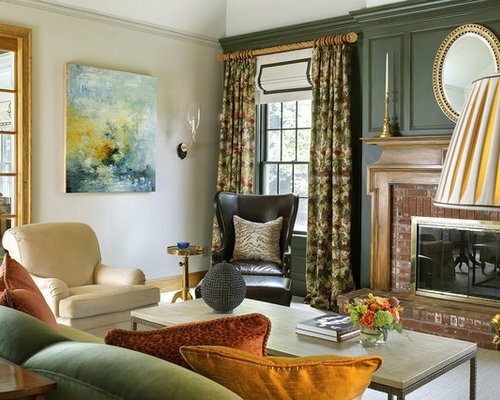 This large family room was thoroughly redesigned into an inviting and cozy environment replete with carefully-appointed artisanal touches from floor to ceiling. 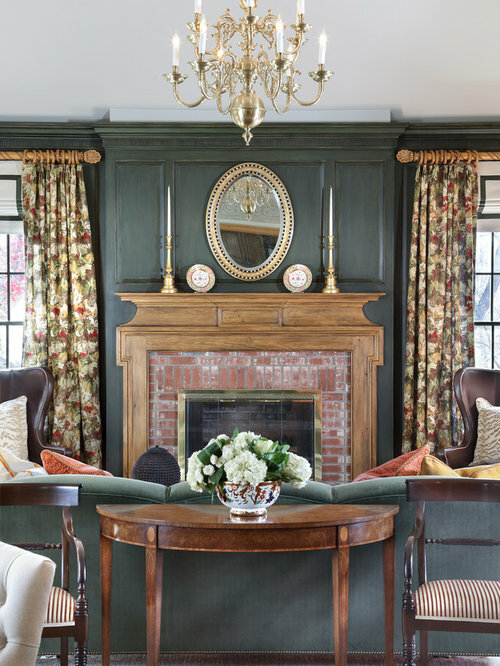 Master millwork and an artful blending of color and texture frame a vision for the creation of a timeless sense of warmth within an elegant setting. To achieve this, we added a wall of paneling in green strie and a new waxed pine mantel. A central brass chandelier was positioned both to please the eye and to reign in the scale of this large space. A gilt-finished, crystal-edged mirror over the fireplace, and brown crocodile embossed leather wing chairs blissfully comingle in this enduring design that culminates with a lacquered coral sideboard that cannot but sound a joyful note of surprise, marking this room as unwaveringly unique.